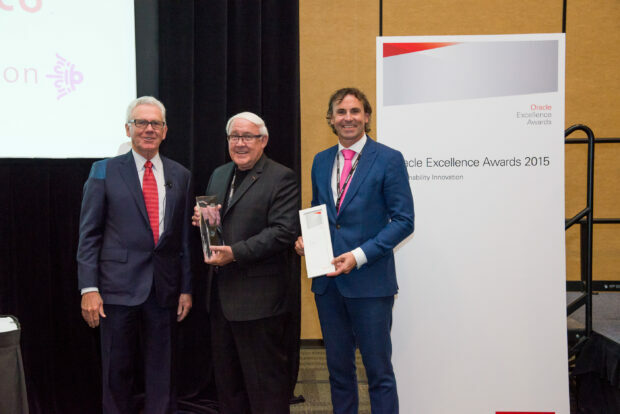 Dutch compliance specialist Pincvision and their client Cisco were recipients of the 2015 Oracle Sustainability Innovation Award in San Francisco. Pincvision helps Cisco comply with all environmental obligations and legislation in every country, thus contributing to the IT multinational winning the sustainability award. To fulfil these obligations for WEEE (Regulations on Waste Electrical and Electronic Equipment) and comparable regulations in other countries, battery legislation and packaging legislation, Cisco has been outsourcing the activities to Pincvision for more than 10 years.Pincvision handles everything and allows Cisco to contribute to the circular economy and lower its environmental footprint. Edo Bosga, CEO of Pincvision, accepted the award in person in San Francisco. ,”I am extremely proud to receive this award from two of the largest and most innovative IT companies in the world. The award is a great recognition for our dedicated services and truecollaboration,” he said. Hey Buddy!, I found this information for you: "Pincvision Awarded for Keeping IT Giant Cisco Sustainable". Here is the website link: https://www.duurzaam-ondernemen.nl/pincvision-awarded-for-keeping-it-giant-cisco-sustainable/. Thank you.